What can change the nature of a fox? Such was the question posed by Dmitry K. Belyaev, a Russian scientist whose work dated back to the time of Stalin. Belyaev was a strong proponent of evolution - a distinctly unfashionable theory in early 1950s Russia - and thought he could select for the genetic traits leading to tameness. 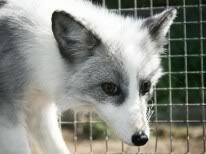 Taking 130 of the tamest foxes from a fur farm, he set to work, excluding those biting a gloved hand from breeding. It turns out reproducing the domestication of dogs in another species isn't that hard . . . In fact, results started appearing in less than a decade. 35 generations of selective breeding later, Balyaev's foxes have the independence of cats, but the devotion of dogs. They'll eat out of the palm of your hand, and seek out human attention with a bark and a wag of the tail. The genetic changes are many. Domesticated foxes have less active adrenal glands. They respond to sound and open their eyes earlier, and show fear at a later date, increasing the window of bonding with humans. Their pigmentation is silver-grey, and patchy (thanks to menalin being on the adrenal hormone path), and their tails are shorter and roll in a circle. Male skulls have become more femininzed. And while you can normally set your calendar by the vulpine mating season, domesticated females have started to mate out of season - though the offspring don't survive to adulthood. So can you go out and get a domesticated fox pup? Yes! Several have been sold in the past to Scandanavian furriers, seeking animals who didn't suffer in captivity. Unfortunately the unpredictable fur patterns and tail lengths made for a hard sell, so they decided to market the foxes as house pets instead. Just don't expect it to be cheap - the going rate is $5,950. See also: How Belyaev's research is being applied to rats.